Frank Napoli runs Atlantic Pizzeria, which features the specialties of his mother, Teresa. Atlantic Pizzeria is not your average neighborhood pizza joint. Beyond the eclectic decor -- brick arches, ceramic tile, walls covered with framed images of baseball memorabilia, Old Hollywood and classic rock -- the picture-perfect pizzas are displayed above a case full of particularly lucious-looking specialties: big, fat stuffed artichokes, delicate fried zucchini sticks, bright green broccoli rabe. Most remarkable are the salumi (Italian cured sausages): sopressata, both hot and sweet, and capicolla, all of which are made by Teresa Napoli. Teresa and Rocco Napoli bought Atlantic Pizzeria in 1988, a few years after they returned to Long Island from a decade-long sojourn in their ancestral home, the Calabrian town of Marina di Gioiosa Jonica. Twenty years later, their son Frank runs the store, and his primary responsibility is to support and build upon his mother's artistry. Frank proudly recounts how when a family would slaughter a pig back in Calabria, they would call upon Teresa to supervise the butchering and make the most out of every part -- the hind legs for ham, the loins for roasts, the shoulder for various salumi. 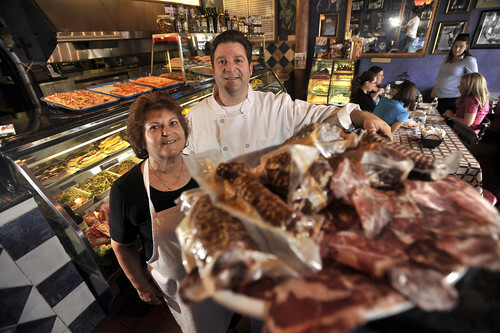 Here on Long Island, Teresa works with American pork; other ingredients -- fennel, hot pepper -- are sent from Calabria, and the small amount of wine called for is made by Rocco. The results are extraordinary -- smokily spicy, deeply unctuous. "I put my mom's salumi up against anyone's," Frank says. "Not everyone appreciates it, but some people do and that's what keeps us alive."